Throughout the dark ages, Christianity had difficulties setting down roots among the Germanic tribes. Stories are told of saints who came to the German people and destroyed sacred trees and mystical places in order to show the people that their gods had no power. Even after Christianity took hold and the Catholic Church was established in the Germanic territories of the Holy Roman Empire, evidence shows that the Germanic people held onto their beliefs in goddesses, magic, herbal remedies, and pagan practices. 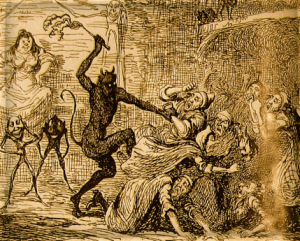 This entry was posted in Bamberg, Germany, History, Writing and tagged #earlymodern, #germanhistory, #witches, Germany on February 20, 2017 by lauralibricz. This time of year, the days are discernibly longer and in the evening, the blackbird sings alone on the rooftop. I watch the plants grow day for day, like my patch of Bärlauch. I stop by every morning to see how it’s coming along. This is going to be a good year for Bärlauch. 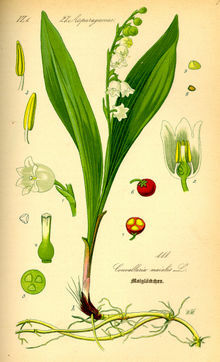 Native to Europe and Asia, ramsons or wild garlic (Allium ursinum) was used by the Romans as a healing herb. The sulfurous substance Alliin oxidizes when the leaves are chopped, forming the medically effective Allicin, a naturally occurring antibiotic. The leaves need to be picked before they get too old. Once the plants bloom, the leaves lose some of their healing properties. But we have a few weeks until that happens. Actually, in Germany, wild garlic is on the Red List of endangered plants and it’s not really legal to pick it if you come across it alongside a creek. The leaves also bear a strong resemblance to the poisonous Lily of the Valley, so please be careful if you are out on a nature hike. The saying goes that bears come out of their winter hibernation and search for wild garlic. They eat the leaves and dig for the roots. After a long winter sleep, wild garlic regulates digestion, is used to counter flatulence, stimulates appetite, and sinks the blood pressure. 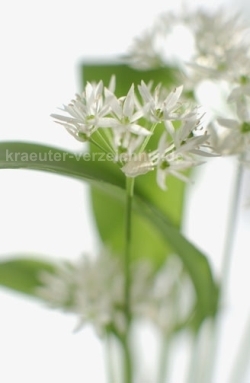 Traditionally, wild garlic was used to treat intestinal parasites: worms. I’m all ears (or eyes). Share your favorite recipe with me! This entry was posted in Food and Drink on February 18, 2017 by lauralibricz. Everyone knows the feeling of being bombarded by unwanted noise: sitting at a bus stop on a busy street, walking through a wood-working shop when all the machines are running or suffering through a drum solo at a concert. But these noises eventually come to an end when we physically remove ourselves from the source. This is not the case for someone with a noisy brain. For certain people, confused chattering and never-ending streams of internal stimuli can be uncomfortable to the point of being considered a full-blown mental illness. Conflicting thoughts can no longer be sorted. Distraction is the result and concentration is almost impossible, so it is believed. The afflicted person finds he/she can no longer function in a ‘normal’ community. But is the ‘afflicted person’ not functioning properly or are the demands of the so-called normal community amiss? Of course, a person must learn to function in society, work to earn his keep, provide food for himself, have a happy relationship with a partner and maybe even have children. But must this schema define the way life has to be for everyone? Relationships, marriage and children and, for that matter, office jobs, are overrated. For some, they may not be right. The introvert may not want to have meaningful relationships with other people. Is this a reason to bend a person’s mind into submission using medication? Let’s look back to the dawn of the hyperactive condition. When did this really start? Sometime when certain pharmaceutical companies found they had a surplus of speed and no legal market? Hyperactivity was believed to be outgrown when the patient reached adulthood. Outgrow the condition and the consumers of legal drugs drop. So what do ‘they’ do? ‘They’ decide today that the condition is not outgrown; a physical hyperactivity grows into an adult, mental one. 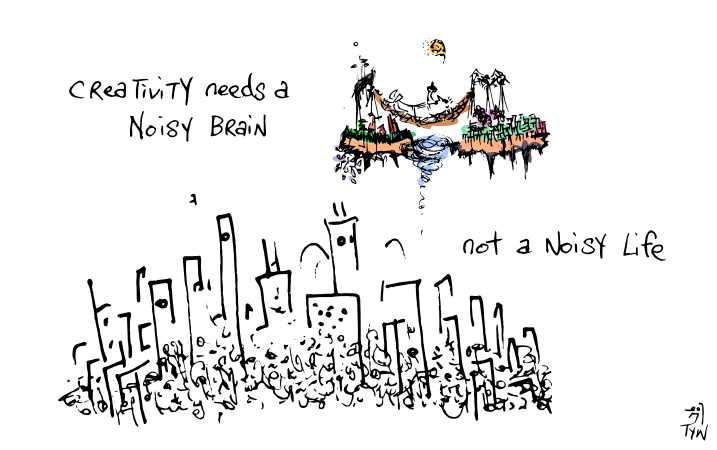 Hence the noisy brain. Is it really impossible for the noisy brain to concentrate and be productive or is it rebelling against unnecessary demands, useless processes and just plain boring, dumb stuff? Sit a poet or a painter down in front their tax return and command them to fill it out. Watch them go into chocolate shock. Lock a musician in a physics lecture. See him chew his finger nails off. Put a bank manager in an artists’ gallery and have him while away four hours painting a picture when he knows the stock market is still open. His hair turns white. The moral of this story? Be true to yourself. You know what you want to do. Nobody can do it for you. Nobody can take it away from you, either. Give yourself permission to be yourself. This entry was posted in Writing on February 9, 2017 by lauralibricz.